Also we might have to wait a few hours after the Saturday game to find out if we play in the finals later that afternoon. Depending on if we have won any of course. I think our constitution actually requires us to wear red and black. Well done to Gav and the boys for the 1st preseason hit out. Was impressed with our level of fitness at this stage. Good luck for game 2. Go Westies!!! West Adelaide bounced out of the blocks to hold off Glenelg by 29 points in Game 3 of Australian Unity Fast Footy. With new Bloods coach Gavin Colville using his skipper Tom Keough in attack, the former Gold Coast Sun didn’t let his boss down by booting four goals in the opening term. Coming on top of a Super Goal to NSW recruit Matt Eastman, Keough’s dominance would have been a nice element for Bloods fans to take out of the contest. Glenelg worked its way back into the match with four majors in the second term but it wasn’t enough as talented Bloods teen Izak Rankine put the icing on the cake with two classy goals. The second of which produced a memorable celebration, when Rankine produced a back flip after converting his set shot. Ian Milera proved to be a livewire for the Bays up forward, booting two goals, including an impressive intercept on the 50m arc. GOALS – West: Keough 4, Hupfeld 3, Rankine 2, Agostino. Glenelg: I. Milera 2, Papatolis, Sires, Hosie, Jordan. Due to ill health i watched the game on youtube which was a different experience in itself. Totally endorse bloodsfireup comments as it was a quality win for gavin and boys. Thing that most impressed me was i felt that the attacking use of the ball and accuracy of kicking has shown strong improvement over summer period. Who was the team in grey and black cause its NOT west adelaide === ffs our club colours are red & black ! Impression i gained was not a lot of onlookers present one comment i read indicated 80 --- if true and low attendance repeated today then sanfl is realy in strife when free entry etc is taken into account. Given Youtube presentation was free then cannot realy complain with the general camera work being rather good --- ionly thing i would like to see is sanfl get involved and sponsor a live commentary. Game 2 is at 1.30 v Port, then we have to wait around for all the other games to finish to see if we play finals later tonight. A very small crowd in attendance, looked around the 1,200 mark (if that) and i think the SANFL would be disappointed. FB probably biggest question is was there no injuries apart from normal soreness. Oldfella wrote: FB probably biggest question is was there no injuries apart from normal soreness. Thanks Oldfella, it was difficult last night in steamy conditions with not having much time time to enter the change rooms which were the old ones under the main grandstand, we had to wait for the Eagles to clear out and then had 40 minutes to set up, it was all hands on deck to get players strapped and warmed up. No injuries from last night that i know of. When they say FastFooty, that includes property and medical staff as well. It seemed to me that it was a good hitout and we looked in good nick. New recruits, Lyndon Hupfeld and Matt Eastman looked promising. The modified game suited Murray Waite and he was good, along with several of our more experienced players. Tom Keough actually kicked 4 goals in about the first 6 or 7 minutes, then played the next quarter at the same end of the game, in defence. Players, apart from midfielders, had to stay in their zones, so take that into account when considering goalkickers, etc. I know it doesn't mean anything but it's still nice to get a win in the first half of the year for a change. Aldo, your words are correct --- preseason game of no importance except fitness and coaches viewing players but a win is a win. we would have to be a fair chance for final later today? Semi final at about 6.40. Lucky Bundy didn't post this he would have been banned for life. 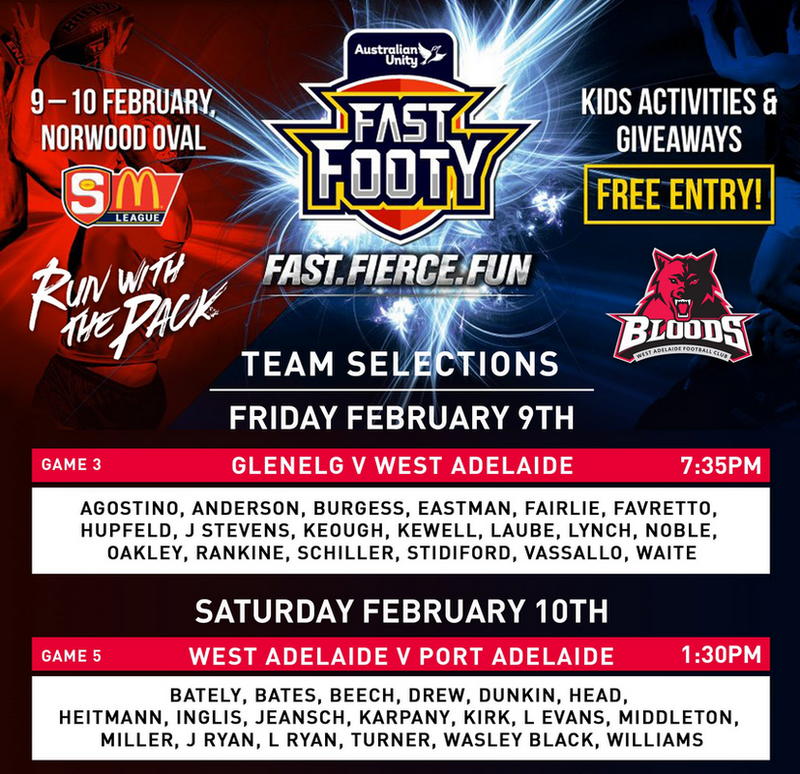 Nice try mate hut did not win a prize --- nothing in the comment about west adelaide or any west adelaide player coach official or employee. Fairly sure this post will be deleted tomorrow. Not even "bloods fire up" will like this post and he likes everything.